The loudspeakers just finished blaring the Muslim prayers at 5 pm. I know this is a sign of disrespect for Jews, but it is part of the character of this divided city. I am sitting in a coffee shop that borders a busy street and people are hurrying by on their way home from work. Two men are singing a hebrew-tinged version of "Volare" as I eat my soup and sandwich. Today is a day of blessing, but an unexpected bunch of them. The beginning of the day I nearly caused an Arabian riot on Pickpocket Hill. Idea dead to buy an 'authentic' Arabian headdress to bring back for our Children's Pageant, and I mistakenly pitted two men against each other, which resulted in a shouting match that nearly caused violence to erupt. So just when you were wondering if I was safe, I nearly caused my own demise! Haggling is a good thing, but stick with just ONE vendor, ok? I did end up with the headscarf for half price, however. We then walked down the Mount of Olives to the Garden of Gethsemane. Remember that most of these things are now housed in elaborate churches, as was the rock they believe He prayed on. The church is built to be purposely gloomy to reflect the somberness of the experience but as we walked in they were holding the service and the priests were chanting and it was astonishingly beautiful even though it was in fact gloomy. The tour continued on as we headed towards the church of the holy sepulcher. However my day changed rather dramatically at that point. I was being a nosy body and I was watching what someone was doing on the street when I tripped over a concrete pillar or pylon or some short concrete object. Consequently I broke my wrist very severely, and have spent the rest of the day in the emergency room in Jerusalem. They have stabilized the rest until I get back to the US in order to have surgery. But that is a blessing to! Because I didn't have to have surgery here. I also have medical travel insurance. Which will be a great help. So please excuse any spelling errors or grammatical errors that I've inserted in this blog entry. I'm trying to speak my entry into the computer and sometimes it gets things wrong. But again we're blessing! Imagine that I can simply talk and my words are recorded in order to transmit them so easily to all of you. My name regret is that I am missing the final dinner with my team as I sit here by myself in the coffee shop. But I know I will need more time to pack tonight and get ready for my return trip home. I'm looking so forward to seeing all of you and to telling you about the miracles of this trip. So forgive this entry if it's very short, because I need to go back and get myself ready to get on the plane tomorrow. I certainly would appreciate your prayers as I negotiate the many security checks baggage claims and other challenges that await me tomorrow. But I have never doubted in God's providence, and I don't doubt it now. This trip has been an extraordinary experience grace, love, Faith, and blessing. But I'm going to have to wait to tell the rest of the story until I heal a little bit more. Please pray for me as I am praying for all of you. See you all soon! 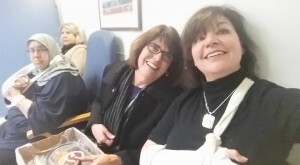 My friend Debbie and I at Gates of Heaven Hospital in Jerusalem. All is well and I am still planning on coming home tomorrow. However I feel like such a goon. "It is...it is like pudding with cheese." (Said with a German accent). This was a description of our dessert tonight, given by one of the staff from our guesthouse at Christ Church. Every night it has been a kind of guessing game. A bowl of fluffy looking stuff appears at the end of dinner in various colors--bright pink or green the first two nights, so I didn't try it. But tonight it was pretty intriguing. It was a pale yellow with real chocolate shaved on top! So I tried it, and she really nailed it...pudding with cheese. Sigh....this country is not known for its sweets, let me tell you. The view from Masada was stunning. The Dead Sea was turquoise ringed by white salted edges from wwwwaaaaaayyyyyy up high. I'm going to be at a loss for words again, because I felt something bigger, expansive, when I was up there today. As difficult as life must have been (carting water and supplies up the mountain every day up the SNAKE PATH--real name. ), it was so beautiful to feel as though you were perched up on the edge of the world. If you have ever been to Olana in Columbia County, kind of like that, but with spare, desert scenery plus, well, the Dead Sea. We were held up by the road washout, which I talked about in Facebook. Everything came to a halt. It had rained in the mountains, not anywhere near us, and the resulting water caused mud and stones to flood the road in front of us. We considered it part of the whole experience and we all got out of the bus and ran to the front of the line to watch the bulldozers clear the road of debris. We made a short stop at Ein Gedi, where David hid from Saul in a cave and spared Saul's life while Saul was, well, peeing in the cave as he hunted for David to kill him (you cannot make this stuff up, as I have said before--see 1 Samuel 23). It is a desert oasis. Then on to the Red Sea where we were, once again, the only tour group. Winter has been generous to us and we have had NO lines, but really horrible weather :) I would choose no lines over good weather anyway. In good weather, the lines are sometimes so long that people can't do or see the things they came to visit, like the Church of the Holy Sepulcher (tomorrow's scheduled trip although, as you know, I already stumbled in there) or the site of Christ's birth. The Red Sea was just fun. I did not swim, and hadn't intended to, but several people did and it was such a kick to watch them bobbing around in the water. You can just sit in the water and it supports you! I did dip my finger in and it tasted unbelievably salty. The salt also makes the bottom quite slick and challenging to negotiate. 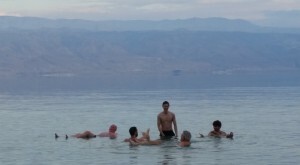 But our crowd managed to slather on some Dead Sea mud and then float around for about 1/2 an hour. I think it was there that I really began to miss everyone already. We have such a great group of people, several young priests that I would be proud to call MY priest. Samuel, the 30 year old chaplain from North Carolina who is simply good to the center of his being; Andrew, a new dad from Florida who came with his wife Mimi and who updated us every day with pictures of their new son, aged 8 months and staying with Grandma, and Matt with his wife Liz, the horticulturist who delighted us with her own delight in all the plant life. Today's surprise was a beautiful purple basil growing wild. And Brook and Dawn who hold a special place in my heart. Brook is a priest in FL also, and he and I are going to try and work together to get a group to go to a teaching conference in Kenya since the bishop from there has asked me to come and teach his female clergy. Brook is on the board of SOMA, a missionary organization. Then there are others--Hali and Grant. Hali is a Jersey girl who made me feel right at home. We laughed at so many things--like how Northern girls say 'Dawn' very differently than southern girls. Bert and Charlie are a married couple--62 years!--who are traveling with us and I have never seen more fortitude, or more love than I have in these two. Imagine taking your first trip to Israel in your 80's! So be prepared for me to come back a little lost and a LOT tired. The sickness I referred to has me in its full grip right now, and I am praying that I am well enough to keep the agenda tomorrow. I know I will, even though we will be outdoors for 8 hours in the cold rain...sigh...again. And tomorrow's agenda is the best--the Mount of Olives, the Garden Tomb and, once again, the Church of the Holy Sepulcher. They have saved the most emotional things for our last day, capped by our last dinner together. God has been so generous to all of us, creating a new family where there was not one before, giving us new understanding of Jesus' own life story as it affects our own lives. It I not just that we are walking in his steps, it is that our steps are now recorded in this place too, that this has become a kind of home for us. Once you have been here, you are not the same. It is not a vacation or a frivolous trip, but a transformational experience. My heart is branded by the beauty and the suffering, by the stories that I have heard as well as the stories I am now part of. Such grace. With God, there is always more. And now I better try to rest for tomorrow, carrying all of you with me as I visit the places of crucifixion and resurrection. I pray you are well, and would appreciate your prayers that I am well tomorrow. The Dead Sea was so beautiful and the people who swam in it bobbed like corks! (See Below) Guess what we saw today? 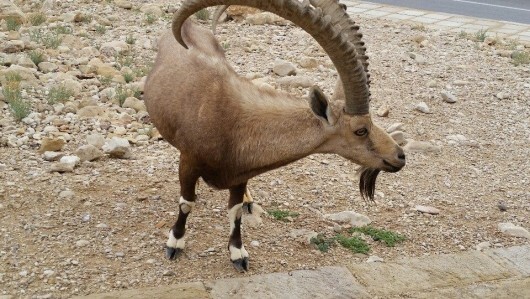 Who recognizes this animal? "Yad" means memorial, or literally a hand that acknowledges or waves in recognition. "Shem" means a monument or name. Thus, Yad Vashem, the name of Israel's Holocaust memorial museum, can be understood as being a recognition of the names of those who died. It is a beautiful and harrowing museum that tells numerous stories of both survivor and those who died. Cast in concrete, the museum does not permit you to wander; you must see all of it once you enter because the path is clearly defined. Yad Vashem attempts to record the name of every Jew that died in the Holocaust, to catalog any stories from that person's life, to make sure they are not forgotten. While we were here, perhaps 100 Israeli soldiers were there at the same time, and our guide explained that the soldiers have numerous field trips and historical treasure hunts that they go on in order to clearly learn their country's history. Schoolchildren are required to take one trip to the holocaust museum once they are over 10 years of age also. I am impressed that the soldiers don't merely learn to fight or defend, but they learn about what they are defending and why. I'm not saying that I agree or disagree with Israeli requirements to serve in the military, but I believe it is a great blessing to learn your own country's history. The most beautiful, haunting and moving part of the museum was a separate small building that honors the children who died during Holocaust. Once again,,there is only one pathway through, and as soon as you enter, you walk down a ramp into near darkness, holding onto the rail for guidance. I don't understand how the experience is accomplished, but I was suddenly in a world where candles flickered al all heights behind glass walls, but they appeared to have multiplied, like there were hundreds of dancing stars in a sea of darkness, and the most mournful music played, as if human tears could have a song, or heartbreak had acquired a melody. I thought of the verse in Genesis where God told Abraham that his descendants would number more than the stars, but Abraham did not know that those tiny lights would be so fragile during Hitler's reign. Over the music, a woman's voice is heard reading the names of the children who died, their ages and their country of origin. 1.5 million children lost their lives in the Holocaust. Our next stop was Bethlehem, located in the West Bank, and therefore under Palestinian control. 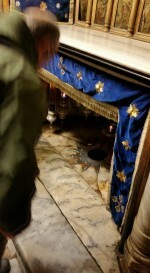 We were there to see the place where Jesus was born, but like many places of reverence in this country, it is contained in an ornate and over-dressed space, and the actual place is not accessible to the pilgrims who travel there. The Church of the Nativity is the oldest Christian church in the world, and it is currently undergoing massive repair and restoration work, so much of the church was inaccessible, but because of the HORRIBLE weather, more snow, rain and icy temperatures, there were no other pilgrims in the church. We were told that the wait to descend into the small shrine area could be hours, but we had no wait at all. Walking down ancient, worn stone steps, the shrine area looks like a small fireplace with a silver star in the middle of it. Pilgrims bend down and stick their heads in the space to kiss or reverence the star which marks the birthplace. There is room for perhaps 20 people altogether, and a Catholic priest is always present to 'guard' the spot. Once we had all taken pictures and paid our devotions, our little group began to sing the chorus of "O Come All Ye Faithful"-- O come let us adore him! And then one more chorus with the words "He alone is worthy!" It was a moving tribute to mark the time we were there. But it is impossible to truly grasp. We are entering and leaving these places more quickly than I can absorb them. I needed more preparation and reflection time before descending to the place that commemorates Jesus' birth. The blessing of the tour is that we have the opportunity to see so much that we could never see on our own, but the schedule is a constant limiting factor. An example: we were only able to spend ONE hour in the Israel Museum which catalogs the history of the country from the beginning of recorded history. We practically ran through, but at least we saw part of it. And here's another problem--NO free time other than the evening to shop for gifts. I'm not much of a shopper, but I feel compelled to buy some things, and there simply is not the time or opportunity. Quick example: my sister expects me to buy her daughter (my niece, a Jew) a wedding present here---ahhhhhh!!! Not only am I unable to shop, but even the few stores I have been in are primarily Christian, not Jewish. So I am feeling the weight of other's expectations on me. I am also getting sick and I can feel the slow advancement of a cold as it creeps over me. I really cannot describe what an endurance test it is to sightsee for so many hours, to walk for miles in the wind and rain, and some snow. And yet I would not change the agenda because I am getting opportunities I would never otherwise have. Both the Old and New Testaments are acquiring greater depth for me, and I am just beginning to grasp the importance of the Temples that were constructed here. Did you know, for example, that the Temples (both the First and Second Temples) were built on the hill where it is believed that Abraham brought Isaac to sacrifice him? Every place is layered with this kind of history and meaning, and thanks to our guide, I am slowly putting together the pieces of Israeli history, especially as it becomes my history--OUR history. So while I began this day with the sadness and weight of the Holocaust, we ended with the beauty of new birth and new life in the place where Jesus was born. Tomorrow we head to the Dead Sea and Masada. 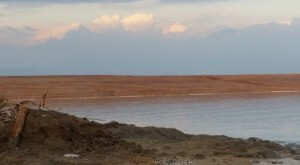 Some brave souls think they are going to try and swim in the Dead Sea--the temperature may reach 55 degrees!--and the high salt content makes it impossible to sink. As our guide said, everyone floats like a cork. Interesting feeling, I bet. But I will definitely not be swimming tomorrow. Even as we speak I am sitting huddled by a fake electric fire, wrapped in my micro-down coat, trying to keep warm. And here's a wonderful parting detail to end the day's activities--we just finished having a Messianic Seder at dinner time and the very last line, as we held up our final cup of wine was "Li-shanah Haba'ah Bi-rushalayim! ", or "Next year in Jerusalem!" We never knew that we would be saying those words in Jerusalem this year...and who knows about next year? ?